1. The purpose of the individual shoreline environment designations is to provide for different regulations applicable to different shoreline areas in response to the specific shoreline conditions of each area such as geography, hydrology, topography, habitat, infrastructure, and existing and envisioned land uses. The purpose of each designation is as provided in the goals and polices in the City of Snohomish Comprehensive Plan’s shoreline element. 2. The purpose of the regulations applicable to individual environment designations is to encourage development and land uses that enhance or are compatible with the desired character of the environment while establishing reasonable standards and restrictions so that the environment is not adversely impacted. C. The shoreline environment designations are depicted on the Shoreline Environment Designation Map within the shoreline element of the Comprehensive Plan and below (Map B). The mapped designations are based upon and implement the designation criteria provided in the shoreline element of the Comprehensive Plan. In the event of conflict between the Shoreline Environment Designation Map and adopted designation criteria, the criteria shall control. Any land located within the shoreline jurisdiction without a shoreline environment designation shall be regulated as Urban Conservancy environment until the Shoreline Environment Designation Map is amended. 1. Shoreline buffers shall be measured perpendicularly to the OHWM. Where wetland buffers also apply as specified by this chapter, the widest buffer width shall be required. a. Removal of improvements within the minimum prescribed buffer whether through intent or natural causes, except where determined to constitute maintenance and repair of existing improvements and except where voluntary partial restoration is proposed to improve the ecological function of the shoreline. b. A change of the primary use of the site in combination with construction of new building floor area within the shoreline jurisdiction. c. Where disturbance of the existing buffer is unavoidable due to the requirements of the use or activity. d. Where required as a condition of approval of a shoreline conditional use or variance. 3. 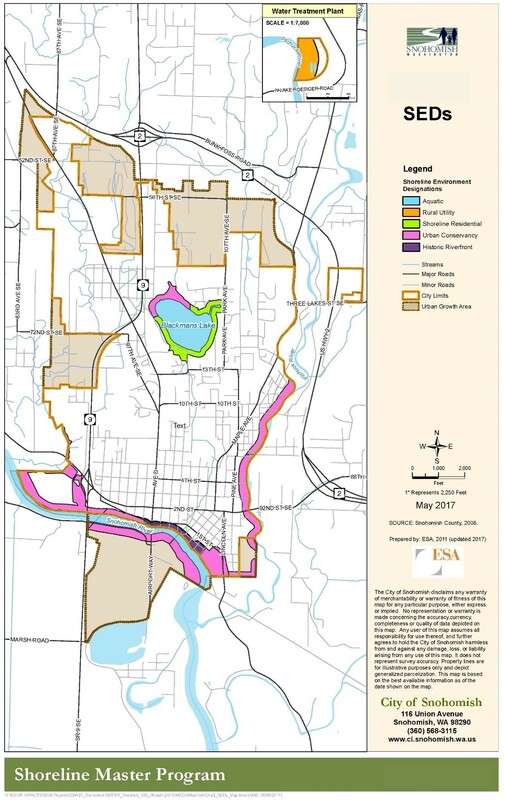 Where the Planning Director, or designee, determines that ecological benefit of strict compliance with the buffer requirements of this chapter is negligible due to separation of sites from the shoreline by an intervening and lawfully created public road or other existing substantial off-site improvements, an intervening parcel under separate ownership, or a publicly maintained flood levee, requirements for a vegetated buffer may be modified or waived by the Planning Director, or designee, irrespective of prescribed buffer widths. A critical area report may be required to substantiate that a buffer would provide minimal or no ecological benefit. 4. Within the Rural Utility environment, a one hundred (100) foot shoreline buffer shall be maintained except for utility facilities and where necessary to provide direct shoreline access by water-dependent uses. Except for utility facilities necessary for the operation of a utility and for water-dependent uses within the buffer, no structures shall be closer than ten (10) feet to the buffer boundary. a. Where direct shoreline access is necessary for water-dependent uses. b. For facilities exclusively designed for public access. c. Where existing pavement or other impervious surfaces encroach into the standard shoreline setback. In such cases, no further encroachment shall occur. Redevelopment of parcels with existing buffer encroachments shall maintain the existing vegetated buffer or provide a minimum fifty (50) foot buffer, whichever is greater. In all cases where a buffer less than one hundred (100) feet is proposed, a vegetation management plan shall be submitted and implemented. No structures shall be constructed within ten (10) feet of a buffer boundary. d. Where existing levees are maintained. In such cases, management of woody vegetation is permitted where determined by the City or flood control district to be necessary for the integrity and continued function of the levee. Unpaved maintenance roadways are allowed along the top of levees. a. On a lot containing an existing, legally established residential structure or public recreation use, new structures and impervious surfaces may be located within the setback area without a variance; provided, that if such modification adds more than two hundred (200) square feet of impervious surface within the setback, an equivalent area of the setback shall be enhanced with native vegetation. Where provided, the enhanced area shall abut the OHWM, shall be a minimum of ten (10) feet from any path or structure, except fences, and shall be permanently maintained in native vegetation. b. Development of a lot without an existing residential structure or public recreational use may modify the buffer to provide usable area along the shoreline. A buffer so modified shall provide an equivalent in area to a standard buffer and shall abut the OHWM. Impervious surfaces may encroach into the setback; provided, that an equivalent area of buffer is provided in addition to the standard buffer requirement. All designated buffer area shall abut the OHWM, shall be a minimum of ten (10) feet from any path or structure, except fences, and shall be permanently maintained in native vegetation. 7. Within the Historic Riverfront environment, the regulated buffer shall be that area waterward of the Riverfront Trail, where applicable, and for all other areas shall be the first one hundred (100) feet from the OHWM, except where direct shoreline access is necessary for water-dependent uses or for public access to the shoreline.